A recent phishing scam has targeted Mac users by redirecting them from legitimate websites to fake websites which tell them that their computer is infected with a virus. 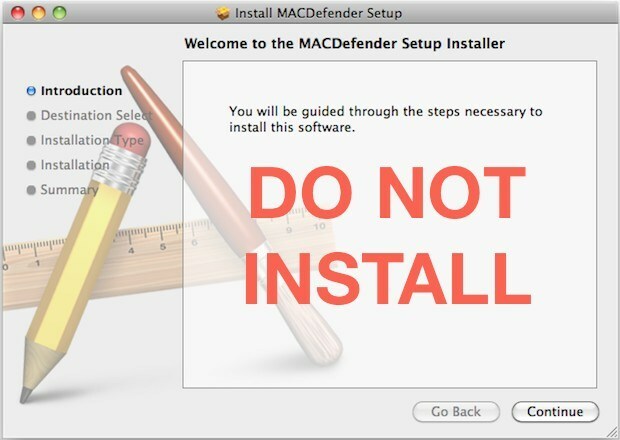 The user is then offered Mac Defender “anti-virus” software to solve the issue. This “anti-virus” software is malware (i.e. malicious software). Its ultimate goal is to get the user’s credit card information which may be used for fraudulent purposes. Apple has announced in a new support document that an update to Mac OS X will be issued in “the coming days” to find and squash malware. This malware comes through supposed anti-virus software that is actually built to steal private information like credit card numbers. Mac Defender is a fake rogue anti-spyware program that for the Mac OS operating system. This infection is spread through the use of advertisements on web sites that pretend to be fake online scanners. When these fake scans are finished, it will state that your computer is infected and then automatically download the Mac Defender program onto your computer. Once the program has finished downloading, the installer will start and prompt you to install the program. Google & Mobile Payments System… What It’s All About? – 5 articles that explain it best!